In Mormon theology both the freedom of the individual to choose their course of action and the duty of obedience to authority are stressed as sacred values. The tensions created by these contrasting values are symbolically expressed in Mormon myth and sacred ritual. This article traces the paradoxical expression of symbols of obedience and free agency in the Mormon Preexistence myth, which is found both in Latter-day Saint scripture and Temple rituals. It is argued that the paradoxical emphasis on freedom and obedience is reconciled through rituals of choice in which Mormons act out their willing deference to the decisions of authority figures. For myth and ritual have common psychological basis. Ritual is an obsessive, repetitive activity–often a symbolic dramatization of the fundamental ‘needs’ of a society, whether ‘economic,’ ‘geological,’ ‘social,’ or ‘sexual.’ Mythology is the rationalization of the same needs, whether they are all expressed on overt ceremonial or not. Someone has said ‘every culture has a type conflict and a type solution.’ Ceremonials found to portray a symbolic resolvement of the conflicts which extant environment, historical experience, and selective distribution of personality types have caused to be characteristic in society. Contemporary Mormonism maintains a seeming contradiction in combining an authoritarian and dogmatic ecclesiastical structure with an active theological emphasis on free agency as central to the very concept of human nature. White and White (1981:47) rightly noted that “. . .few organizations so closely resemble the classical pyramidal bureaucracy. All power to allocate and mobilize institutional resources resides at the apex.” Yet Leone (1976:722) is also able to argue that “Mormonism is neither authoritarian, hierarchical, nor literalistic but, in matters of doctrinal interpretation at least, is diffuse, egalitarian and loose-constructionist” that in this and in its this-worldly ability “to sacralis day-to-day activities” (p. 730 it meets Bellah’s (1964) criteria for a Modern Religion. The expression of this tension of opposites in Mormon myth and its manifestation and potential resolution in ritual will be explored in the remainder of this article. The roles of myth and ritual as alternate expressions of the same underlying value conflicts can be illustrated in Mormon theology and rite with examples that demonstrate how the same tensions engendered by conflicting values may receive their symbolic expression through the creative acts of an individual or through social evolutionary processes within a group. In this paper, Mormon creation beliefs will be shown to express a tension between the values of freedom and coercion, a tension that is present in Mormon concepts of church governance and that is given release in Mormon ritual life. When O’Dea (1957:165) described Mormonism as a “democracy of participation and an oligarchy of decision-making and command,” he touched on a central paradox in Mormonism that has a variety of manifestations. One is its simultaneous emphasis on obedience to the authority of its ecclesiastical leaders and on respect for the sacred quality of the freedom of choice of its members. The conflict between these contrasting values is symbolically portrayed in the Mormon creation myth in which some pre-born human spirits lose the possibility of salvation by paradoxically exercising their divinely given freedom of choice to relinquish their agency in return for the promise of salvation made certain. This myth reflects a tension between the competing values of obedience to ecclesiastical authority figures and the freedom of individual choice, a tension that finds symbolic expression in Mormon myth and ritual. Unlike traditional Christian theology, Mormonism asserts that human existence, like that of God, is an absolute condition rather than a contingent one (McMurrin, 1979:12). Humans are as inherently eternal as is God, and each individual existed prior to mortal life, first as unorganized intelligences that embodied the unique eternal essence of each human individual in immature form and then as spirit children of Divine Parents (Heeren, Lindsey & Mason, 1984). Though they are subordinate to God, human beings differ from Him merely in degree of persona; development; they are not of a different order. This view of human nature as including individual autonomy that is coeternal with, but subordinate to God is embodied in a well-known Mormon aphorism: “As man is, God once was; as God is, man may become” (Romney, 1955:34). And God saw these souls that were good, and he stood in the midst of them, and he said: These I will make my rulers; for he stood among those that were spirits, and he saw that they were good; and he said unto me: Abraham, thou are one of them; thou wast chosen before thou was born. And they that keep their first estate shall be added upon; and they who keep not their first estate [i.e., did not obey God in the pre-mortal spirt world] shall not have glory in the same kingdom with those who keep their first estate; and they who keep their second estate [i.e., remain faithful during the mortal l life on earth] shall have glory added upon their heads forever and ever. And the second was angry, and kept not his first estate: and at that day, many followed after him. In traditional Christianity, God’s transcendence is manifest in His spiritual nature, while human limits are symbolized by the flesh that constrains the spiritual nature of humankind. Mormonism inverts this symbolism, holding God to be a personage of both spirit and perfected body. The Plan of Salvation, God’s plan to create a world in which His spirit family might receive physical bodies and then return to Him, grows out of this nontraditional concept of perfection embodied in spirit united with the flesh. Humans originated in spirit form as the literal offspring of God, but they are limited by their lack of a perfected body, a body like that of their divine Father (see McConkie, 1958:37; Hardy, 1976). Their birth as spirit children of Heavenly Parents (see Heeren, Lindsey, and Mason, 1984) raised them from their prior status as unorganized Intelligences to spirit heirs of God in their pre-earth First Estate. God’s plan for His children was that they might progress to a third and higher status by receiving perfected bodies and, in so doing, become more like Him. And I, the Lord God, spake unto Moses saying: That Satan. . . is the same which was from the beginning, and he came before me saying–Behold, here am I, send me, I will be thy son, and I will redeem all mankind, that one soul shall not be lost, and surely I will do it, wherefore give me thine honor. But, behold, my Beloved Son, which was from the beginning, said–Father, they will be done, and the glory be thine forever. Wherefore, because that Satan rebelled against me and sought to destroy the agency of man, which I, the Lord God, had given him, and also that I should give unto him mine own power; by the power of mine Only Begotten, I caused that he should be cast down. And he became Satan, yea, even the devil, the father of all lies, to deceive and to blind men, and to lead them captive at his will, even as many as world not harden unto my voice. will I send in the floods upon them, for my fierce anger is kindled against them (Moses 7:32, Church of Jesus Christ of Latter-day Saints, 1981). Thus, the Mormon creation myth is built around the tension between the autonomy of personal choice as a God-given attribute of humankind and the divine commandment that all must exercise their agency only to choose obedience to God. Mormonism is well known for the tightness of its organizational hierarchy and for its emphasis on divinely delegated authority as the basis of its organizational legitimacy. The church is governed by what Quinn (1984:16) has called “an authoritarian oligarchy.” The highest ecclesiastical officials are a body of men known as General Authorities, leaders believed to be called to their offices by direct, modern revelations from God. The chief presiding officers make up two bodies: 1) The Quorum of Twelve Apostles, held to be contemporary equivalents to the original Christian Apostles both in calling and prophetic inspiration, and 2) the First Presidency, consisting of the highest church authority, the president Prophet, Seer and Revelator of the church and his two counselors. Below these General Authorities in a descending hierarchy is a chain of command terminating in the local bishops of the church, Each bishop is usually responsible for a local congregation called a ward, that averages nearly five hundred persons. Since the ministry among Mormons is a lay ministry, a large percentage of the local membership is involved in conducting the business of each ward. Those persons regularly involved in the work if the local ward are formally called to do so on a regular part-time basis, so that at the local level there is also a large hierarchically organized body of personnel, presiding over the bishop. Within the church organization, the concept that authority is delegated from above is reinforced by the belief that persons are chosen for the positions that they fill–even seemingly “everyone” positions within the ward, such as teacher in nursery or Sunday School librarian–by divine inspiration. This belief is reinforced by means of rituals in which each person is “set apart” and “given authority” to conduct the work of his or her “calling.” Commitment and efficiency in carrying out the work of each position is emphasized, and Mormons themselves point out that the beehive emblem of the state of Utah is rooted in the religious symbolism of their church (Mauss 1983, 1989). In church activities and assignments, obedience is expected to be unquestioning, since the organization, practices, and beliefs of the church are regarded as based on divine revelation. Obedience is stressed in officially sanctioned publications and teaching manuals. Indeed, in a study of values expressed in the 1982 manuals used for the teaching of all adult males and females in the church, Crapo and Cannon (1982) found that obedience to the church and its leaders was the second most frequently mentioned virtue, accounting for over twelve percent of all value statements. Indeed, over twenty-seven percent of all value statements referred to some form of loyalty to the church as an institution, making institutional loyalty the broadest general theme in these teaching materials. Shepherd (1984) found that obedience was the most consistently stressed value throughout the history of the LDS Church’s semi-annual Conference that were given by Church leaders. At the same time, free agency, the freedom of each individual to choose voluntarily the course of his or her actions, is a central theological concept in Mormonism. According to Mormon scripture, free agency was given to humankind when they were created: “Behold these brethren, they are the workmanship of mine own hands, and I gave unto them their knowledge, in the day I created them; and in the Garden of Eden, gave I unto man his agency” (Moses 7:32). The concept of freedom of choice is so important to Mormon theology that Talmage (1901:33), one of Mormonism’s most respected writers declared: “The Church holds and teaches as a strictly scriptural doctrine, that man [sic] has inherited among the inalienable rights conferred upon him by his divine Father, absolute freedom to choose the good or the evil in life as he may elect.” In matters of Church government, Mormon scriptural admonition insists that “No power or influence can or ought to be maintained by virtue of the priesthood, only by persuasion, by long-suffering, by gentleness and meekness, and by love unfeigned (Doctrine and Covenants 121:41). This ideal is consistent with reports of my own informants that in spite of the hight value placed on obedience and support for church leaders, refusals of callings or other requests for service or participation in church programs are typically accepted without further pressure. Church leaders are admonished in LDS scripture that if a leader tries to “. . .exercise control or dominion or compulsion upon the souls of the children of men, in any degree of unrighteousness, behold, the heavens withdraw themselves, the Spirit of the Lord is withdrawn, Amen to the priesthood or the authority of that man” (Doctrine and Covenants 121:37). Thus Mormon church government, like its mythology, involves two potentially conflicting values, obedience to authority and respect for free agency. This tension between the value of freedom of choice and the demands for obedience is expressed not only in the Mormon “Preexistence” myth but also in Mormon ritual. Many behaviors have been called rituals, from the compulsive behaviors of anxiety disorders or the tics and mannerisms of psychoses to the explicit re-enactments of myth in religious ceremony. Even the simple unselfconscious habits required by social etiquette have been called rituals. Rituals may be the spontaneous creations of an individual grappling with the anxieties of a stressful life, or they may evolve over decades within their anxieties. Customs are passed from one generation to the next. They may be rife with the explicit symbolism of formal ceremony or they may be as devoid of ideological significance as is blase routine. They may be a source of solace and surcease from the cares of life (Malinowski, 1925), or themselves a source of personal distress (Radcliffe-Brown, 1939). The diverse ways in which rituals manifest themselves have stimulated much speculation about the relationship between the most stigmatized and accepted rituals, those of the mental disorders and those of religious worship. Freud (1913), of course, emphasized the similarities between neurotic and religious ritualism. Others (e.g., James, 1902; Jung, 1938; Fromm, 1950, 1951) claimed that religious rituals have more in common with psychotherapy than psycho-pathology. Most have recognized that ritual, wherever found, has some relationship to less than fully conscious ideation–a relationship in which it functions to facilitate the repression of forbidden impulses. Thus, rituals are repositories of conscious or unconscious meaning; they symbolize preoccupations, the problematic nature of which have not yet adequately been incorporated into thought or ideology in a consciously satisfactory way. Dolgin (1974:535) has suggested that Mormon ritual life may be divided into “. . .three primary sub-domains: the Temple rites, weekly worship services (held in local churches) and civil religion.” She has constructed a general outline of LDS temple ritual as a drama in which participants play the symbolic role of humanity in a re-enactment of the Mormon Plan of Salvation myths from the creation of the world through the return of each participant in heaven. For Mormons the Temple is a particularly sacred edifice that is viewed, according to Leone (1977:46) as a sacred place in which members may be particularly close to God. Although Latter-day Saints are encouraged to participate often in Temple ceremonies for special communion and instruction, only those who affirm full support of the church and its doctrines are permitted entry, and the frequency of Temple participation varies from person to person, depending on personal inclination. The central Temple rite is the endowment, a ceremonial re-enactment of the Mormon theology that recounts the history of the world from the creation through the resurrection. In the drama of this re-enactment, the audience is drawn into the sacred symbolism of Mormon theology by taking the role of humankind while receiving special instruction from heavenly personages portrayed by Temple workers. Visiting a temple to participate in this or one of the other sacred Temple rites is a profoundly sacred experience, a kind of pilgrimage into a realm of living scripture, the otherworldliness of which is enhanced by the non-calendrical nature of individual participation, the geographical isolation of the Temple, the architectural symbolism of the rooms in which various parts of the rites are performed, and even by the ceremonial clothing worn on these occasions. Dolgin (1974:537) has noted that “If one takes the Temple ritual as a linear whole and divides it into two halves, one finds a striking parallelism between the first and second halves of the rite . . . That is, if one starts at either end of the ritual . . . and moves toward the center, one notes (or undergoes) a similar series of ordered phases before one arrives at the middle.” The central feature of the ritual sequence is the Fall of Adam and Eve from the Garden of Eden to the mortal world. Immediately before and after this transition, the dominant ritual symbol is the presence of Lucifer. Before the appearance of the devil is a Council of gods who plan and carry out the creation of Adam and Eve, and following the role of Satan is a Council of humanity. With this pattern in mind, one might briefly outline the entire ritual sequence as follows: Participants are prepared for the mythic drama by rituals which separate them from their secular roles and introduce them to the sacred realm, the creation and the Fall are re-enacted, the two Mormon Priesthoods (the Aaronic Priesthood, generally held by males below eighteen years of age, and the Melchizadek Priesthood, held only by men eighteen years of age or older) are introduced as the means of salvation and sacred knowledge is imparted that is necessary for entry into heaven, and participants are ritually restored to their secular roles. Although Dolgin’s division of the Temple ritual into two major parts is not a native classification, its appropriateness is supported by the sequence pattern in the linear progression of the rites. It is also supported by symbolic patterns not discussed by Dolgin, by the pivotal role played in both of her divisions by a ritual of choice. To demonstrate this pattern, it is necessary to return to the issue of the conflict embodied in the LDS story of the Preexistence. The essential paradox of Mormon mythology is that God’s children are required to have free agency but must exercise their freedom of choice by electing obedience to God’s Plan of Salvation. The tension between freedom and required obedience is portrayed not only in the Preexistence myth that forms part of the Temple ceremony, but also in the story of the Fall, which Dolgin regards as the turning point in the Temple ceremony. In LDS theology, the Fall involved a dilemma. Eve had been deceived into eating the forbidden fruit and would have been separated from Adam by being expelled from the Garden of Eden and immorality into the mortal world. Thus, Adam could obey God’s first command, “Be fruitful and multiply,” only by a conscience choice to disobey the second, “Of the fruit of the Tree of Knowledge of Good and Evil, thou shalt not eat.” Therefore, his first truly independent exercise of Free Agency was of necessity a choice of disobedience, but being a “forced choice” that he could not evade, it was not a willful rejection of God’s will but an attempt to choose the lesser of two evils. By partaking of the forbidden fruit, he would remain with Eve and be able to keep what Mormons call “the first and greater commandment” of God, the command to reproduce. In this story, the apparent conflict between free agency and obedience to God is resolved by demonstrating that neither choice nor obedience is a simple unitary phenomenon. Rather, free agency involves complex and sometimes competing choices, and choices must sometimes be made between one form of obedience and other conflicting obligations. Thus, in a classic Levi-Straussian algebra, the paradox is resolved: Free agency is to obedience as disobedience to a lower law is to obedience to a higher law. According to Dolgin, the enactment of the Fall is the pivotal ritual of the Temple rite. This interpretation is cogent not only because of its central place between the reverse ordered halves of the entire drama, but also because this interpretation illuminates another aspect of the pattern: the central ritual in each half of the Temple rite is itself a ritual of choice in which participants are “offered the chance to curtail their ritual involvement” (Dolgin, 1974:539). That is, they are ritually given the chance to leave the ceremony, thus reaffirming the free-agency/disobedience paradox of the human quest for salvation. In this regard mortality is both an opportunity to make proper choices thereby returning to God as well as a risk from exercising free agency in a way that leads away from God, as symbolized by the choice to leave the ceremony. Unlike the Temple rites, within which the individual participates only irregularly, the services in the local Mormon churches are enacted on a weekly basis. The colorful and dramatic symbols of the Temple rites are not found in the weekly services: indeed, the traditional Christian sacrament is sensually weakened in the form of white bread and water. The tone of the services I attended in Arizona was one of relaxed, albeit “spiritual” communitas. The sharp dichotomies between good and evil present in the Temple rites are here minimized. The Mormon actor as “individual before God” is replaced by the unsubstantial community of fellow Mormons. The weekly service that brings ward members together for worship is the Sacrament Meeting. Its usual format consists of an opening hymn sung by the congregation, an opening prayer spoken by a ward member, ward business carried out by the conducting official, the sacramental sharing of bread and water as symbols of the flesh and blood of Christ, short sermons by members of the ward, a final congregational hymn, and a closing prayer. Ward business is the occasion for formalizing changes in the social organization of the ward. Families or individuals who have moved into the ward are introduced and accepted by vote of the congregation as new ward members, and members vote by show of hands to 1) sustain actions of their presiding officials, such as the installation of persons into various offices, or 2) express their willingness to support a recommended plan of action or doctrine. Such rituals of choice occur not just in sacrament meetings but in meetings of any size, up to and including church-wide General Conferences that are held semi-annually. Rituals of choice are especially prominent in these Conferences where the membership is asked to sustain all of the various changes being made in the personnel of the church hierarchy. Although these rituals of choice are actually merely opportunities to express support or opposition to actions being taken by church officials, they are commonly referred to as “votes” even by the officials conducting the process. Expressions of dissent are rare, and in any case the final decision remains the sole prerogative of the presiding officials. Dissenting “votes” at the level of semi-annual conferences are reacted to with shock by the membership as a whole, and persons likely to express dissent during these televised rituals are, in fact, screened from attendance at such conferences to the best ability of the church organization. Particular attention to such screening occurred following an unexpected vocal expression of rejection by five persons in attendance at the nationally televised semi-annual conference in April of 1981. Nevertheless, in spite of the purely ceremonial nature of these rituals of choice the grass-roots member, by frequent participation in them, receives a sense of personal involvement in church government. Through these rituals the individual’s sense of personal commitment to the leadership and policy decision’s of the church government are repeatedly reconfirmed, maintaining a high level of conformity between his or her subjective sense of choice and dictates of church authority. Historically, as recounted by Quinn (1984:16), Mormon voting in the nineteenth century might actually set aside actions proposed by even the Presidents of the church, and sometimes local priesthood assemblies were even polled by secret ballot before church leaders made proposals for personnel changes to ensure that the proposal’s would be acceptable. The prerogative of members to limit decisions of the church hierarchy by vote received less and less emphasis as church membership expanded. While exhortations for members to exercise thoughtful judgment in voting continued to be heard as late as 1969, the democratic emphasis was replaced thereafter by the portrayal of “sustaining votes” as evidence of members’ faithfulness to the divine inspiration of church leaders. As a result of this new definition of the situation, “voting” functions in practice more as an opportunity for members to assent ritually to decisions made by church officials than as a polling of their agreement or disagreement. As such, the votes are almost always unanimous. In the act of ritual voting, Mormons reaffirm their allegiance to the legitimacy of their leaders’ authority to make decisions that members are expected to uphold. By repeatedly affirming support for decisions that flow from above, the individual member short-circuits any likelihood of experiencing cognitive dissonance between private preferences and leadership policies. It is here then, that the potential tensions between the personal choice of the individual and the authority of the church are reconciled, so that authority-based decisions are experienced as expressions of the grass-roots will, rather than as obligations that conflict with personal choice. Bellah, Robert 1964 “Religious evolution,” American Sociological Review 29 (June): 358-74. Crapo, Richley H., and Cannon, Sharon D. 1982 “LDS values as revealed by a content analysis of official teaching materials.” Paper presented at the annual meetings of the Western Social Science Association, Denver, Colorado. Church of Jesus Christ of Latter-day Saints, The 1981 The Pearl of Great Price. Salt Lake City: The Church of Jesus Christ of Latter-day Saints. Dolgin, Janet 1974 “Latter-day Sense and Substance.” In Religious Movements in America, edited by Irving I. Zaretsky and Mark P. Leone. Princeton: Princeton University Press. Pp. 519-546. Fromm, Erich 1950 Psycho-analysis and Religion. New Have: Yale University Press. 1951 The Forgotten Language. New York: Reinhart. Gluckman, Max 1970 “Ritual.” In Man, Myth and Magic, edited by Richard Cavendish. London: BPCC/Phebus Publishing. Volume 17, pp. 2392-2398. Hardy, B. Carmon 1976 “The Schoolboy God: A Mormon-American Mode., “Journal of Religious History 9:172-188. Heeren, Lindsey, and Mason 1984 “The Mormon Concept of Mother in Heaven: A Sociological Account of Its Origins and Development, “Journal for the Scientific Study of Religion 23 (4) :395-411. James, William 1902 The Varieties of Religious Experience. New York: Longmans Green. Jung, Carl G. 1938 Psychology and Religion. New Haven: Yale University Press. Kluckhohn, Clyde 1942 “Myths and Rituals: A General Theory,” Harvard Theological Review 34 (Jan.) :45-79. Leone, Mark P. 1976 “The economic basis for the evolution of the Mormon religion.” In Religious Movements in Contemporary America, edited by Irving I. Zaretsky and Mark P. Leone. Princeton: Princeton University Press. Pp. 722-766. Malinowski, Bronislaw 1925 “Magic, Science, and Religion,” in J. Needham (ed. ), Science Religion, and Reality, New York: McMillan. Mauss, Armond L. 1983 “The Angel and the Beehive” BYU Today. _____.1989 “Assimilation and Ambivalence: The Mormon Reaction to Americanization, “Dialogue (22): forthcoming. McConkie, Bruce R. 1958 Mormon Doctrine. Salt Lake City: Bookcraft. Quinn, D. Michael 1984 “From Sacred Grove to Sacral Power Structure, “Dialogue 17 (2) :9-34. Romney, Thomas C. 1955 The Life of Lorenzo Snow, Salt Lake City: The Sugarhouse Press. Shepherd, Gary, and Shepherd Gordon 1984 A Kingdom Transformed: Themes in the Development of Mormonism. Salt Lake City: University of Utah Press. Talmage, James E. 1901 Articles of Faith. 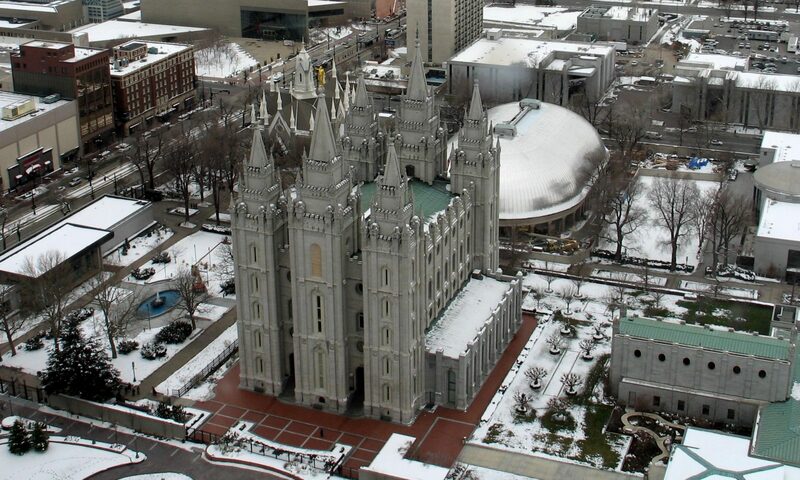 Salt Lake City: The Church of Jesus Christ of Latter-day Saints. Wallace, Anthony F. C. 1966 Religion: An Anthropological View. New York: Random House. White, O. Kendell, Jr., and Daryll White 1981 “A critique of Leone’s and Dolgin’s application of Bellah’s evolutionary model to Mormonism,” Review of Religious Research 23 (1) : 39-53.